This month we are looking at ski touring or skinning, otherwise known as ski mountaineering, or randonnée in French. This is essentially using your skis to access backcountry and relying less on the ski lift system. The big draw of touring is to be able to explore the mountain environment and be at one with nature, escaping the crowds of people, and sometimes getting some fresh tracks. 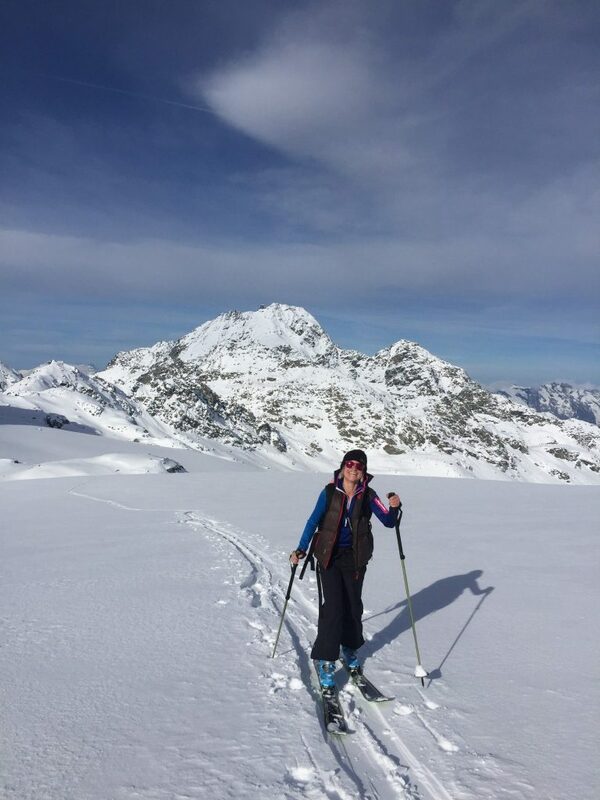 A very general guide is that if you are comfortable skiing on red slopes and can also manage gentle moguls and ice with a little off-piste, then you are probably fine to start doing some gentle ski-touring routes. TIP – When ski touring, you are quite likely to experience varied snow conditions. It is best to be prepared and confident in all conditions to help avoid any injures. Skis used for touring range from very light models intended for maximum uphill mobility and speed, to more freeride designs that are slightly heavier but offer the advantage of some extra ski under your foot for the descent. Bindings for touring are slightly different to alpine bindings, as they allow you to lift your heel when skinning, or lock this down for the descent. They come in two types: frame bindings or pin bindings. Pin bindings are more lightweight but also require specific boots with pin connectors. You will need frame bindings if the boots you intend to use do not have these connectors. When ski touring you will often be entering uncontrolled avalanche zones. For your own safety and the safety of other skiers it is essential that you have the correct safety equipment and also the knowledge of how to use it in an emergency situation. Without an avalanche transceiver, probe and shovel you will not be able to search for someone buried in an avalanche, and no one can find you. TIP – Practise using this safety equipment. Grab some friends, go out in the snow and bury some packs with beacons in them to practise your search skills. TIP 2 – A shovel with a plastic blade isn’t strong enough to dig through concrete-hard avalanche debris. Aluminum is the only choice for safety in avalanche terrain. Where should I go and what snow can I expect? When you first start, it’s advisable to always do up and down tours as opposed to loops or traverses. That way you will be able to study the terrain you will ski back over and follow your own tracks back down. As you become more experienced you can start to plan different, more challenging routes. Having some experience of map reading will be crucial as the routes become more complex. Before you head off in the morning, always make sure you plan your route and remember to take with you a compass and map! Finding good snow, and more importantly safe conditions, requires experience and knowledge of the mountains. To stay safe, it is advisable to go with experienced ski tourers or hire a mountain guide to help develop your knowledge. Finding good snow conditions for off-piste or ski touring is something that every skier strives for. Below are a few general tips to help you understand how to get it right. On a typical ski tour you may find different types of snow, some of which are harder to ski than others. Ideally you should be confident with all types. The easiest to ski is probably “spring snow”, which freezes overnight and then the top couple of centimetres are softened by the sun, followed closely by powder snow on a hard base. You might also encounter hard snow, which can be good to ski, unless it is also icy! Snow conditions that are more tricky to ski include deep powder with no base (sublime but sometimes difficult), and the hardest is probably breakable crust. The priority here is to survive without falling or breaking through the crust. So how do we find the good snow which is easy to ski, versus the hard conditions which can be extremely challenging? This requires a little planning and experience. If it’s been snowing lots, the chances are you will find good powder conditions on all slopes, which will remain good for a while if the temperature stays cold. The north-facing slopes tend to keep the powder for longer periods whereas the sunny south-facing slopes will start to transform over time. Melt freeze will occur on slopes that face east, south and west, and this is where you will start to experience breakable crust… pretty nasty to ski! For more information, please contact us on: 0041 27 771 6006; [email protected]. About Jon “Westy” – Jon holds the top qualifications from France, Switzerland and Britain, and we can say firsthand that he is an inspirational coach. His ski school Altitude is known worldwide for employing a team of fantastic ski and snowboard instructors who are very passionate about helping people improve. Each month Jon or one of his team will provide a few tips and words of wisdom to help improve your understanding of skiing. VERTICAL CHALLENGE – What’s it like to do your first ski touring race?